Buckingham (part of what is now known as Arlington Oaks) was described in one 1939 newspaper as the largest garden apartment complex in the United States. When construction was begun in March, 1937, it attracted nationwide attention as an experiment in the development of large-scale rental housing as a long-term investment for private individuals. Buckingham was also one of the first projects financed by private capital under the terms of the Federal Housing Administration's Insured Mortgage System. However, the participation of the government was limited to insurance of the mortgage. The construction of Buckingham occurred largely due to the efforts of Allie S. Freed, a New York industrialist involved in the automobile manufacturing business. It was Freed's intent, as Chairman of the Committee for Economic and Social Progress, to provide better housing for middle-class American families through the production by private enterprise of a constantly improving product with a constant lowering of costs. A large-scale operation utilizing automobile assembly line techniques made possible this improved quality at lower cost. With his wife, Frances, Freed toured Europe to study large-scale housing developments for ideas. The result was a community of garden apartments, each having cross-ventilation, a modern bath and up-to-date kitchen, and so arranged that there was a maximum amount of space in the community devoted to lawns, trees, and gardens and a minimum of ground devoted to buildings. Buckingham was to have all the convenience of urban existence along with the advantages of suburban location. Construction of Buckingham was done in six phases called "projects". The first unit of the first site opened in September, 1937, and by December of that year, 622 families were living in Buckingham. Due to the continued popularity and demand for the apartments (evidenced by a long waiting list), construction of four more projects followed in rapid succession. When Allie Freed died in January, 1938, Frances assumed the responsibility for completing the community in accordance with her husband's wishes. By September, 1941, an article in The Washing Post noted that the Buckingham Community represented a city of 8,000 residents, nearly one-fourth the size of Alexandria, which had a population of 33,523 according to the 1940 census. At that time this residential total was twice the populations of Laurel and Marlboro, Maryland combined. As completed, the Buckingham complex consisted of 100 acres, improved with 183 brick garden-type apartment buildings containing 1817 dwelling unit. The buildings are predominately two-story, designed in the colonial revived architecture style. Centered within the complex, at the intersection of North Glebe Road and Pershing Drive, is an area of neighborhood service and commercial development. Buckingham continued to be a rental community through the 1970's under the ownership of Frances Freed. In April, 1981, shortly after the Klingbeil Management Group, Inc. of Columbus, Ohio had purchased the Buckingham complex (including the current Glebe Road Apartments, Hyde Park, and the Chatham) from Freed, Buckingham Venture, an affiliate of the Chicago-based Stein and Company real estate development firm, acquired the Hyde Park, the Chatham, and 1,352 garden apartment units of the over 1,800 in the complex. All of these were rental units at the time. It was the intent of Buckingham Venture to convert all of the garden apartment units purchased to a cooperative form of ownership in three phases. However, as a result of slow sales, only the 372 units in Phase One of A-1 project were converted. 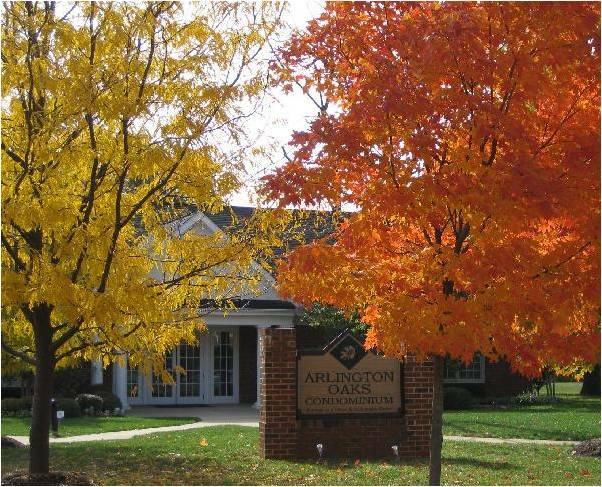 The cooperative, Buckingham Village Housing Corporation (later known as Arlington Oaks Community Association, Inc., and converted to Condominium on May 1, 1995), held fee simple title to the land and buildings comprising Phase One, known as Arlington Oaks. The remaining 980 units owned by Buckingham Venture were sold in 1983 to Hall Management Company of Southfield, Michigan. These units were initially to remain rental housing, subject to possible condominium conversion at a later date. Ownership of Buckingham Village, a rental community, consisting of all the original property not owned by the cooperative, is currently divided among Hall Associates and the Klingbeil Company. The natural surrounding (including the rare black squirrels) and quality of life at Arlington Oaks today remain a tribute to the inspiration and determination of Allie and Frances Freed. In 1992, Arlington Oaks initiated an extensive beautification campaign. Buckingham Community at the time of its completion in 1940, was the largest garden-apartment complex in the world. Its 125 acres included most of the ninety-eight-and-a-half acre Virgil Corbett estate plus some smaller holdings. On the north side of Henderson Road lay the Cathcart Estate. Seeking data on these two pre-Civil War farms, I found myself in the home of the Paden family at 440 North Park Drive, on the remaining acreage of the Cathcart Estate. I talked with Mrs. Paden and her charming mother, ninety-two years young in spirit, who was Virgil Corbett's daughter. In 1886 when twenty, she was married to twenty-nine-year-old Arthur W. Cathcart. He was an outstanding mechanical engineer whose inventions are now in the Smithsonian Institution. When I asked Mrs. Cathcart what had brought her husband's family into this area, there unfolded a tale which could have come from the Arabian Nights! I was shown two history books about the amazing career of her husband's grandfather, James Leander Cathcart, and parchment documents signed by John Adams, Thomas Jefferson, and James Madison. James Leander Cathcart was born June 1, 1767 in Mount Murragh, Ireland, and at the age of eight sailed for America with a group of colonists. The following year, wishing to serve his new country in the Revolution, he signed as a cabin boy on a privateer sailing from New York. Within three years, the twelve-year- old lad was a midshipman on the frigate Confederacy. He was taught sailing by a Portuguese helmsman from whom he learned his language. From the Spanish navigator he learned celestial navigation, mathematics and a strong command of Spanish. When fourteen he was captured by the British and thrown into a prison ship in New York harbor. While imprisoned he learned how to survive under horrible conditions and acquired French from some troops who were fellow-prisoners. Upon liberation at the end of the war, Cathcart chose merchant sailing as a career. His love of the sea and his knowledge of navigation and foreign languages admirably fitted him for this field of enterprise which had been previously monopolized by the British. In 1785 the eighteen-year-old lad signed up in Boston as second mate of the schooner Maria, bound for Cadiz, Spain, with a trade-cargo of furs, lumber, and dried codfish. As the broad, dumpy Maria reached the southwest tip of Portugal in a thick fog, it was attacked and captured by Barbary pirates. The men were stripped and taken aboard the stream-lined Corsair, where the filth and brutality of the prison-hold contrasted with the silks and rugs of the luxurious quarter of their English- speaking captor, Yusuf Rais. The Barbary pirates were the true rulers of the sea, extracting "tribute" from the nations of the world for "protection". Otherwise, their ships were preyed upon and captives held for heavy ransom. Our new nation was unable to pay either, so Cathcart realized that his only chance to free himself and his fellow prisoners was to ingratiate himself with the pirates until such time as he could personally build up a fortune by his wits, toward their eventual ransom. Cathcart's capabilities were recognized immediately by his captor who gave him an opportunity to sail the slim swift vessel Yusuf Rais had designed. For eleven years, Cathcart was held prisoner in the walled city of Algiers. Here he found favor with the High Dey who appointed him overseer of the Americans. According to their plan, they made themselves indispensable around the palace and grounds as masons, carpenters, painters, and gardeners. Cathcart learned to speak Arabic and Turkish. He was put in charge of feeding the Dey's pet lions, whose choicest meats he smuggled to his fellow captives. The British Consul of Algiers offered to arrange for their freedom in exchange for lifetime service to Great Britain, but they vetoed this opportunity as traitorous. Captain O'Brien, a later captive, who became the Dey's secretary, smuggled Cathcart's letters to American authorities, whose attempts to raise ransom were futile. It was finally through Cathcart's carefully arranged political moves and hoarded funds that he and the remaining twelve of his crew (ten had died) were eventually freed. On May 22, 1796, Cathcart sailed for America on his own ship, the Independent. When he reached Philadelphia, he joined others in persuading Congress to create a Navy and he influenced the design of the famous frigates which were then built: the United States, the Constitution, and the Constellation. In June 1798 Cathcart married a Philadelphia belle, and by December was enroute to the Barbary States where he held the highest positions in our consular service. Backed by our new naval power, he was able to negotiate important treaties at Algiers, Tunis, and Tripoli. In 1800, the Cathcarts came to Georgetown when the capital was moved to the new Federal City. They moved to Madeira in 1807 where he had been assigned as Consul General; later to Cadiz, his youthful destination before capture by the pirates. The Cathcarts returned to Washington in 1817, where he continued to hold important offices until his death in 1843. His descendants treasure a note from Thomas Jefferson to the Senate, which reads in part, "...Cathcart, who was appointed by Mr. Adams and confirmed by the Senate as consul to Tripoli. He is personally known to me; he is the honestest [sic.] and ablest consul we have with the Barbary powers; a man of sound judgment and fearless..."
The Virginia farm was bought by the son (named for his friend) Thomas Jefferson Cathcart, as a summer residence. His son, Arthur, courted the lass on the adjoining farm, and their marriage brought the Virgil Corbett and A-3 A-3 Cathcart estates into one family. They resided on the farm, in a series of homes including the Paden residence built in 1922. All of the above, as well as other material about the Commonwealth of Virginia, may be found at the Arlington County Central Library at 1015 North Quincy Street. The Arlington Historical Society maintains a museum at 1805 South Arlington Ridge Road; call 892-4204 for information.